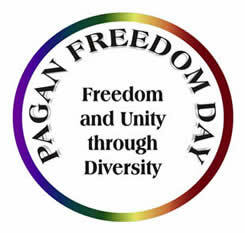 The Pagan Freedom Day initiative was birthed on 11 November 2003 to facilitate an annual national and regional celebration of 10 years of Pagan Religious Freedom in South Africa on Freedom Day 27 April 2004. In January 2004, this initiative was formerly chartered as the Pagan Freedom Day Movement (PFDM). Since its inception, Pagans across the country have willingly embraced the ideal of Pagan Freedom Day, namely to encourage Cooperative Community building amongst Pagans and between Pagans and non-Pagans. It is hoped that by fostering a positive and holistic South African Pagan identity, we can promote understanding and tolerance amongst Pagans and between Pagans and non-Pagan South Africans. Regional Communities have been formed to facilitate these ideals and to foster both Pagan identity and consolidate cooperative community building. Diverse Pagan individuals and groups have rallied together under the banner of Freedom and Unity in Diversity.